Melissa is wonderful, her shop was on vacation and she still found time to do a readin for me. It’s a wonderful thing to connect with loved ones. She’s truly an angel in my life. Melissa is very helpful. And she truly cares about her customers. Her shop was on vacation and she still did a reading for me that was very needed. This is my second reading from her and I hope to continue business with her as my life goes on. It’s amazing connecting with your lost loved ones. Thank you so much, you truly are gifted and very kind. I highly recommend Melissa ! While working in a dental office, Melissa was making a nice side income from her hobby of creating imprinted jewelry and selling her unique pieces to friends, family and coworkers. Her customers couldn’t get enough of her personalized jewelry. Melissa soon found herself looking to turn her hobby into a full-time business. On a whim, she decided to purchase her own kiln from a private seller and got more than she ever bargained for. When she discovered the kiln’s owner was soon leaving on a mission to Israel and looking to sell her entire jewelry business, Melissa decided to take the plunge and become a full-time jewelry maker. Talk about kismet! Besides selling her handcrafted jewelry on Etsy, Melissa has online shops on CustomMade, Hatch.co and ArtFire. Each piece is expertly handcrafted by Melissa using the techniques she’s learned while traveling the globe. Melissa uses only the finest precious metals available – all made from recycled materials and absolutely eco-friendly. “I was first introduced to Jewelry making in Cape Town. It was there that I decided that I wanted to become a jewelry teacher and, ultimately, to sell my own artwork. Since then, I have traveled the domestically & internationally to learn different styles and techniques, both modern and ancient, that I’ve added to my product line,” Melissa explains. 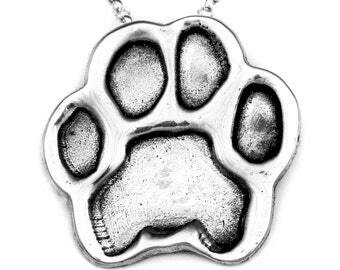 That's My Impression creates from these precious metals, Melissa creates personalized memorial rings, necklaces, pendants, cufflinks and jewelry from pets. Each is handcrafted by using an actual fingerprint, thumbprint, hand print, footprint, pet’s paw print, child’s drawing, image, or actual handwriting – all from INK & PAPER or a photo. Molds are rarely used, and only at the purchaser’s request. Additionally, Melissa wants to be sure buyers know that, even if a loved one has passed on, she can still use a copy of their inked fingerprint or a note that they wrote. What a lovely keepsake! Melissa Hansen loves interacting with clients and customers. Be sure to connect with her on Facebook, Twitter and Pinterest. Thank you for checking out my handcrafted custom fingerprint jewelry and personalized keepsakes. Your actual fingerprint impressed in fine silver. Leave a lasting Impression with the rich beauty of fine silver and a polished finish. A timeless romantic symbol of love. Personalized items are NON-REFUNDABLE - I work closely with you to make sure you love your custom piece before it is sent to you. Rest assured I would not send out anything that I would not wear with pride myself! I provide full refunds or exchanges for non-personalized items that are returned in their original condition within 5 working days. Return shipping costs are the buyer’s responsibility. Please do not message me with your credit card number as Etsy conversations are kept forever. I ship worldwide. Because items are made to order it may take up to 6 to 8 weeks to make your item prior to shipping. Please let me know if you need them sooner and I will see if I am able to accommodate you. I am not responsible for lost or damaged packages and all shipping fees are non-refundable. Shipping does include tracking but DOES NOT include insurance unless it's priority mail. If your address and your PayPal address are different, please indicate which one you would like your order to be shipped to. I make every effort to create your items 4-6 weeks after payment has cleared. This is the time it takes BEFORE your item is ready to ship. This does not include shipping time over which I have no control but usually take 2 to 3 days to deliver. During periods of heavy volume, such as holidays as this time may be increased. All components of your necklace are under warranty for 60 days from the date of purchase. Should your chains break from normal wear and tear during this time frame I will replace them for you free of charge. After that period there will be a minimal fee to replace broken/loosened components. Pieces sent back for repair will be inspected, polished and all components checked and tightened before being returned. * DO NOT wear when using Body Sprays, Perfumes, Hair Spray or Household Products. Your jewelry should be put on AFTER you've applied or come into contact with these items. * The best way to care for your piece is to use a piece of polishing cloth and GENTLY rub it to remove the tarnish. Be careful of removing the darkening in the letters or fingerprints. You can also soak it in warm baking soda and scrub with a toothbrush. * If you are not wearing your piece, store it in an air tight container or zip lock bag. Feel free to contact me for quantity discounts. How do I take a fingerprint? Usually 4 to 6 weeks depending on my work load. Holidays can add more time as this is the busiest time of the year. If you need it by a certain time frame, I do offer a fee to get bump in the line. Contact me for more info.